"Everybody likes me. I'm the black Tom Hanks." 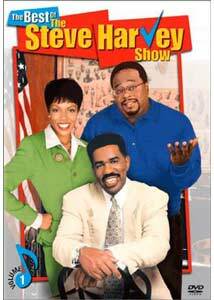 To be completely honest, I did not know that there was a Steve Harvey Show in existence. The reasoning for my ignorance in this area was that my only knowledge of the gifted comedian came from his inclusion in the hysterically funny The Original Kings of Comedy, a stand up concert film that I hold in very high regard. So it was with intrigue that I viewed the five episodes included on The Best of The Steve Harvey Show: Volume 1, and by the time the disc was over, I was pleasantly surprised. The Steve Harvey Show revolves, not surprisingly, around actor/comedian Steve Harvey in his role as Steve Hightower, a former music star who is forced to seek work as a music teacher at an inner city high school in Chicago, where his friend, Cedric Robinson (Cedric the Entertainer), is the coach. Soon, he is promoted to vice principal, and his immediate supervisor is an old friend who Steve once gave loads of grief to. The episodes included on this DVD are a collection of five of the best from the overall run of the series, which ran for six seasons from 1996 until 2002. Included are: That's My Mama, Educating Piggy, Welcome To Bernie's, Little Stevie Blunder, and My Whole Left Side. The episodes run the gamut from being too clichéd (That's My Mama) to surprisingly tender and heartwarming family material (My Whole Left Side). The tendency for the show to delve into the conventions of other sitcoms on television does little to distract from the prominent positive aspects of the show. There's one story of a high school heartthrob torn between the two dates he has made for a Saturday night, but at the same time the show tackles the issues of family and jealousy. The episodes showcased on this DVD face these latter issues without a single, heavy-handed moment, and that makes for pleasant viewing. My lone complaint for this single-disc collection of episodes is the arrangement in which the episodes were compiled. By spanning the first four seasons, the DVD opens numerous plot holes and events that have taken place in other episodes not included here. This is the fault of any "Best of" compilation of television shows, and it is frustrating when a show is as nicely done as The Steve Harvey Show. Image Transfer Review: The full-frame presentation for The Best of Steve Harvey: Volume 1 is a fine effort from Columbia TriStar Home Video. The picture is clean with no scratches or grain, while sharpness and detail are adequate for the release of a television series on DVD. Colors are nicely done, and the black levels show nice depth. Audio Transfer Review: The Dolby Surround track is largely anchored in the center channel, with nice dialogue throughout. The left and right speakers, as well as the surround channels, are given very little activity. Extras Review: A trailer for Bad Boys II is included in anamorphic widescreen with Dolby Digital 5.1 surround. A nice little television show that was previously unknown to me, The Steve Harvey Show is an entertaining sitcom that is worth a rental for the uninitiated viewer such as myself.